Scalp psoriasis may be defined as psoriasis of the scalp. Psoriasis is a skin inflammatory disease. It is characterized by itching and red and fine scales on raised papules. Any part of the body can be affected by psoriasis, but it commonly occurs on the scalp. Psoriasis of the scalp is in the form of dry, scaly and fine plagues. Plague varies from mild to severe form. In mild conditions, plagues are fine and slight but in moderate to severe cases, crusted silvery white colored plaques are produced in excess. They cover the whole scalp and may extend up to the neck, eyebrow, and around ears. If scalp psoriasis is severe it may cause severe itching. Irresistible scratching may result in hair loss. 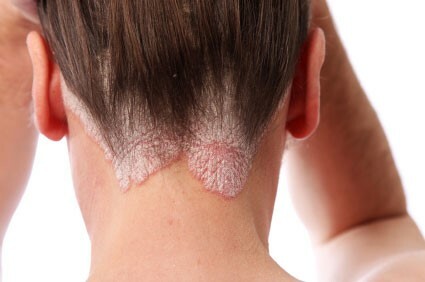 Psoriasis of the scalp are very much similar to Seborrheic dermatitis, but the main difference between them is that Seborrheic dermatitis is greasy. Psoriasis is caused due to the faulty signals that the body immune system receives. Due to it, skin cells starts growing rapidly. Skin cells produced in excess piles up and forms plaques on the surface. Scalp psoriasis is not contagious and does not spread through contact. People suffering from psoriasis may have a family history of this disease. Genetic disposition affecting the immune system. Environmental factors like diet and allergy. Emotional stress may trigger psoriasis and also make pre-existing psoriasis worse. Infections such as tonsillitis, bronchitis, flu, pneumonia and other respiratory diseases may flare up psoriasis. Injury- Any kind of injury, trauma, cut or too much scratching of the scalp. Medicines such as propanol, lithium, medications for high blood pressure, heart such as quinidine, antimalarial drugs and anti-inflammatory drugs such as Indocin may trigger scalp psoriasis. Red, inflamed papules covered with fine silvery Scales. Hair falls due to scratching. A dry scalp that crack and bleeds. The scalp may burn and sore. By examining your scalp doctor can easily tell you if you have psoriasis. The doctor may send a bit of your skin to the lab to test and confirm the diagnosis of Scalp psoriasis. Salicylic, selenium sulfide and tar containing shampoos may help to remove scales. Always apply a good conditioner to seal the moisture and prevent dryness. The doctor may recommend Corticosteroids and steroid based creams, gels and solutions to eliminate scalp psoriasis. Chilled moisturizers, lotions, and petroleum jellies may give you a soothing effect if applied on plagues. Apply cold packs and can take a head bath of cool water to relieve the itch. Massage your scalp gently with Derma-smooth FS scalp oil or Mineral based P&S solutions at night. shampoo your scalp in the morning to loosen and get rid of the scales. The doctor may prescribe antihistamine pills if the itching is very severe. In severe cases of scalp psoriasis, the doctor may prescribe ultraviolet Phototherapy or may inject Triamcinolone directly into the plagues. Scalp psoriasis is incurable, but one may control it if diligent attention is given to it.